Until 1914, with perhaps the single exception of the Black Death, no great events had left a universal imprint on family life in Great Britain, though invasions, civil wars, industrial and agricultural revolutions had at different times affected people in different degrees. The outbreak of the First World War changed all that and every man, woman and child in the British Isles found themselves involved in the titanic struggle which was to dominate their lives for the next four years. "My brother Horace had not been home for over two years and had not been heard of for some time, when word reached Middleton that he was walking home from Banbury Station. Mother waited anxiously and was overjoyed when he walked up the yard that day. Immediately on arrival I remember Horace being stripped of all his clothes, as he was completely overrun with lice; some were so large that I remember using a small hammer to kill them on the flag-stone floor of the outer wash house." 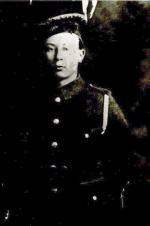 The first soldier from Middleton Cheney to be killed was Private Francis Williams of the 2nd Battalion. Northamptonshire Regiment who died of wounds at the Field Ambulance Centre located at Estaires, Nord, France on Sunday 29th November 1914 . He is buried in Estaires Communal Cemetery, he was 23 years old. Francis was the son of Charles (a Road Labourer) and Margaret Williams and the family lived in one of a row of cottages in the Thenford Road (To date the village archivist has no other information). "ARE WE GETTING ALL THE MEN WE SHALL WANT TO PUT INTO THE FIGHTING LINE NEXT YEAR TO ENABLE US TO HOLD OUR OWN? Mr Lloyd George asks the question in his preface to 'Through Terror To Triumph.' This photograph – the result of our volunteer system – brings home the pertinence of the query. It is of Corporal Jerrams of the Oxford and Bucks Light Infantry (which he rejoined this year), with his wife and twelve children. Two of his sons have joined the New Army. Mrs Jerrams who lives at Middleton Cheney, near Banbury, draws from the State her own separation allowance of 12/6 per week, and 26/6 for eleven of the children – a total of 39/- per week. MEANWHILE THE SINGLE SLACKERS WAIT TO BE FETCHED!" Although the photograph shows Corporal Edward Jerrams (civilian occupation – Bricklayer in the 1901 census) together with his wife Ruth and two of his sons, Horace and Richard in uniform, in fact the pictures of the two brothers were superimposed. Horace was still abroad and Richard had already been killed on the Somme. clambered up the assault ladders and into no man's land. Their orders were to advance at a steady pace so as not to become disorganised. An amazing solution was devised to control the troops – each platoon was given a football and allowed to kick it forward and follow it. In this way they were encouraged to advance across 400 yards of territory which was covered by German machine gunners. As one Lieutenant Colonel remarked, "I think myself, it did help them enormously, it took their minds off it"! The casualties from the Mametz and Montauban areas of the offensive, were taken to the new Casualty Clearing Station Number 21. Richard Jerrams was wounded in this battle and died three days later. He was buried in La Neuville British Cemetery on the 4th July, one of the first 70 men to be interred there - all of them had died of wounds received on the First Day of the Somme. Richard was 21 years old. On the 1st July 1916 the British Army sustained 57,470 casualties, of which 19,240 were killed or died of wounds. The village has a remarkable collection of letters written by Pte. Henry Alfred Gibbard (Alf) who wrote regularly to his sister, Daisy after he had enlisted. He talks about the living conditions on Salisbury Plain where the troops camped in tents and scathingly describes it as – "The last place on God's earth!" He later writeshome about life in the trenches, which includes an account of a German soldier coming across for dinner, who confided to his new-found English friends that the German troops were running short of ammunition. On another occasion he wrote, "It is no good being 'frit' out here - as only the frit get hit!' (Photocopies of these letters are available in the village archive). Alf's family lived at The Firs which is located on the Main Road at the top of Washle Drive in Middleton Cheney. Sadly, Alf was another casualty of war and died of wounds on Sunday 7th November 1915, he is buried in Corbie Communal Cemetery on the Somme in France, which was about 20 kilometres behind the front trenches. His memorial card; "In loving memory of our dear son." 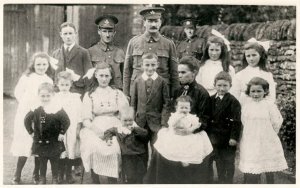 (parents Henry and Amelia) contains the photograph of 19 year old Alf in the uniform of the 6th Battalion, Northamptonshire Regiment and is inscribed, "Greater love hath no man than this, that he lay down his life for his friends." 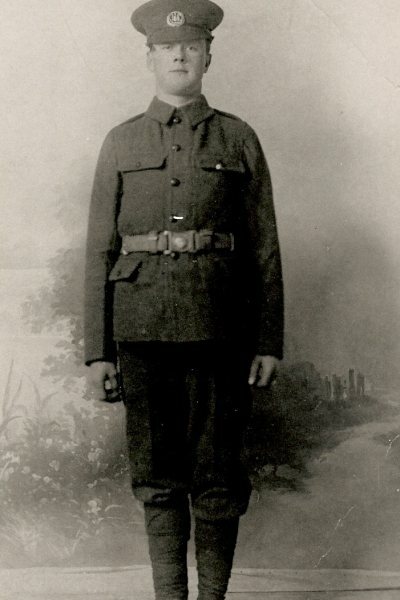 Albert was very tall for his age and only 17 years old when he was stopped in the village and told to go and fight for his country. 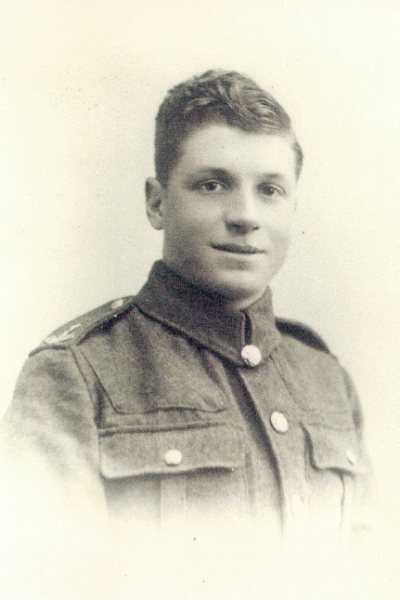 As a result he enlisted in the Royal Naval Volunteer Reserve, having possibly lied about his age (as many volunteers did) and was attached to Howe Battalion. This detachment was sent straight to the front and with very little experience, Albert was killed almost immediately. Private Wellesley Donald Charles Jarvis, son of Alfred (a Butcher) and Adelaide of 'The Hollies' Middleton Cheney enlisted in Northampton and joined the The Queen's Royal West Surrey Regiment. He is buried in Bagneux British Cemetery at Gezaincourt on the Somme. The village was close to a railway line with the result that the area was heavily used by Casualty Clearing Stations. 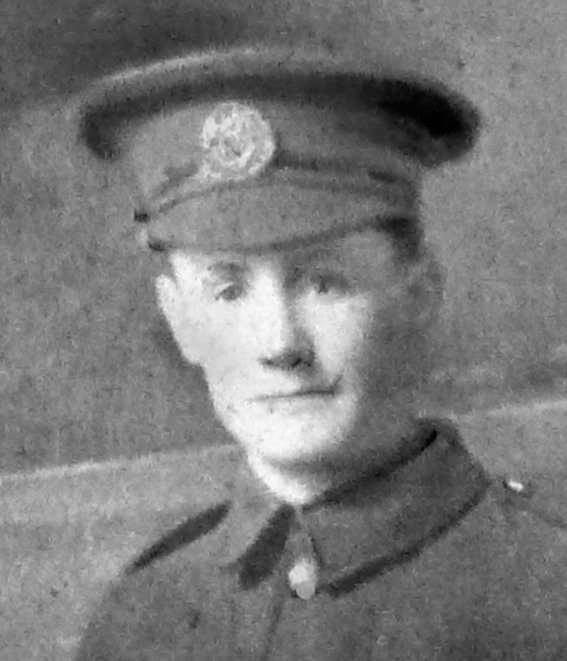 Wellesley died of wounds on the 5th July 1918, he was just 18 years old. There are 1,373 graves at Bagneux Cemetery – half of them, 'boy recruits' recently arrived from England. 1918, 22nd November - Lieutenant Joe Baker, an old scholar and scholarship lad buried today in the parish churchyard. He died at Oxford Hospital of wounds received in action in France. Flag hoisted half mast. 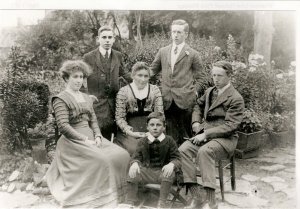 There were many reasons for enlisting in the Army in 1914 and 1915: Boredom with work, a longing for adventure, a desire to escape family pressures or responsibilities, as well as a belief in King and Country. Most Britains still commonly believed in the innate superiority and righteousness of their country, and had little interest in, let alone knowledge of, other cultures. Within society, there was a broad acceptance that the rich man had a God-given right to his castle while the poor man stood eternally by his gate. These are, of course over-simplifications, but few would have questioned a man's abiding duty to his country. Whatever the motive, one characteristic was particularly pronounced among boys aged eighteen or less. Why were boys called up at eighteen when they would have been fitter, stronger and generally more competent at twenty or twenty-one? The answer is simple: not only were eighteen-year-olds very susceptible to propaganda and more willing than older men to accept orders, but they were great believers in their own indestructibility, with a general incomprehension of risk or danger. Today we can see this on every ski-slope or skateboard park. In 1914, boys climbed high trees or ice-skated on frozen lakes. They also survived childhood illnesses that frequently took brothers, sisters or friends, and seen men injured at work. They were aware of death and injury but accustomed to their consequences. If they had thought for one moment that they might actually die in France, one can only wonder if as many would have enlisted so willingly. 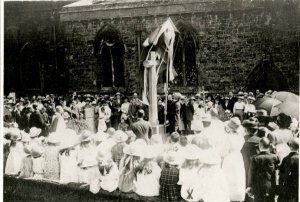 My thanks to the families in Middleton Cheney and descendants, who have shared their memories and photgraphs which are included in the village archive. All the names on the War Memorial are commemorated, together with the records available on the Commonwealth War Graves Commission website - www.cwgc.org.